Due to the overwhelming success of this event, we are implementing timed entry tickets this year. Tickets will be sold for entries every half hour from 5 to 9 pm. The Site grounds will close at 10 pm. NOTE: 5:00 to 6:00 are now sold out, and 6:30 will likely sell out in advance of the event. There are actually a lot of tickets from 7:30 to 9, so think about coming a little later. 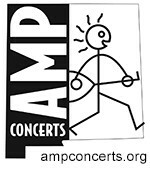 Tickets are $12 for adults and $7 for kids (including all service charges). Shuttles will be available between the Village of Jemez Springs and the Historic Site. The ruins of Gisewa Pueblo and San José de los Jemez Mission Church will be decorated with hundreds of traditional farolitos. The evening's events will include Native American flute music and Native American dancers performing between two bonfires (luminarias). 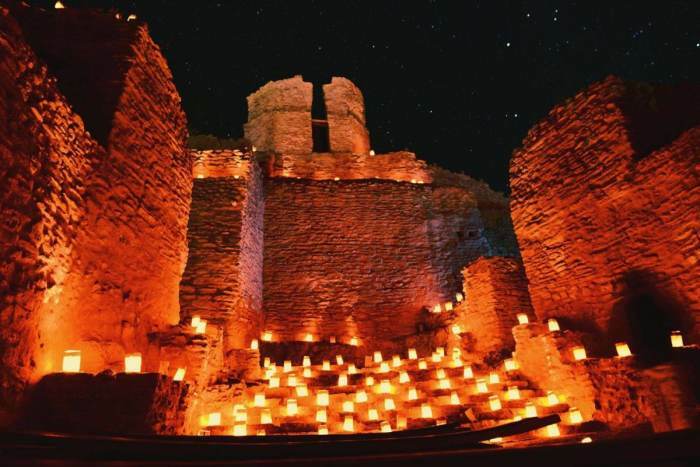 The combination of the lights with the pure beauty of the ruins nestled into the gorgeous Jemez Valley canyon walls makes for a magical setting! Free shuttles will be available between the Village of Jemez Springs and the Historic Site. The event is held regardless of weather. A short drive from Albuquerque and Bernalillo, the Jemez Historic Site is one of the most beautiful prehistoric and historic sites in the Southwest. 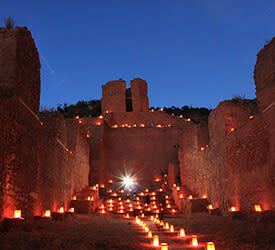 It includes the stone ruins of a 500 year old Indian village and the San José de los Jemez church dating to 1621/2. The village of Giusewa was built in the narrow San Diego Canyon by the ancestors of the present-day people of Jemez (Walatowa) Pueblo. The name Giusewa refers to the natural springs in the area. In the 17th century, the Spanish established a Catholic mission at the village. The mission was short-lived, and, in time, the people abandoned the site and moved to the current location of Jemez Pueblo. The massive stonewalls were constructed about the same time the Pilgrims landed at Plymouth Rock. The heritage center contains exhibitions that tell the story of the site through the words of the Jemez people. A 1,400-foot interpretive trail winds through the impressive site ruins.